Preheat the oven to 375°F. Place the crust on a pizza pan or baking sheet. Spread 1/2 cup dressing over the top of the crust and sprinkle with Parmesan cheese. Bake for 10 – 12 minutes or until bubbly. Meanwhile, in a medium bowl, toss the romaine lettuce with the remaining 1/4 cup dressing; set aside. In a medium skillet, heat the olive oil over medium heat. Add the garlic and shrimp and sauté for 1 – 2 minutes or until heated through. Stir in the lemon juice, salt, and pepper. 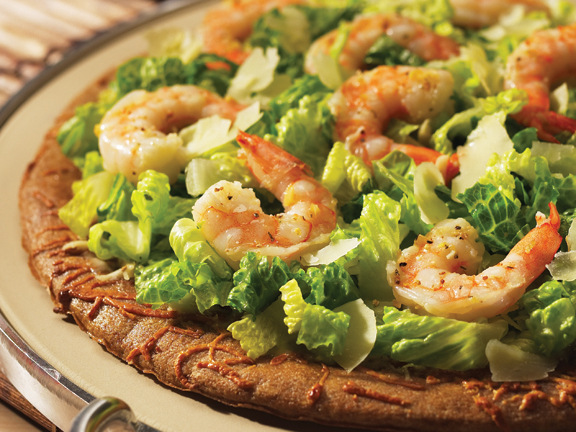 Spread the romaine mixture on the baked pizza crust and top with the shrimp mixture. Cut into wedges and serve.